The burial place of the great and good of Portugal, the gleaming white National Pantheon has its roots in the 17th century but was only finally completed in 1966. Constructed to a design by Lisbon’s Baroque master-craftsman João Antunes, it is a mini-me of St Peters in Rome, with a highly intricate, colonnaded exterior topped with a central dome. Climb six flights of steps up to the top for matchless views over the city to the River Tagus. Inside the church is a riot of highly patterned mosaic flooring, gleaming white marble adorned with gilt, and memorial cenotaphs to Vasco da Gama and Henry the Navigator. The vast, 18th-century Baroque organ was moved here from Sé Cathedral in the 1940s, and famous names interred in the nave include a string of Portuguese statesmen and the revered fado singer Amalia Rodrigues. Tuesdays and Saturdays see the fascinating Feira da Ladra flea market fill the Campo de Santa Clara in the shadow of the National Pantheon; it is a pleasant jumble of stalls selling anything from knock-off DVDs to vintage fashion. Located at Campo de Santa Clara, the site is open Tuesday through Sunday from 10am to 5pm. Take Tram 28 to Arco de São Vicente or the Metro to Apolonia – although this involves a steep uphill walk. Discover Portugal’s UNESCO-listed folk heritage during an intimate dinner show in Lisbon. Start your evening soaking up the atmosphere of Lisbon by night as you explore the historic Alfama district and admire illuminated landmarks like the National Pantheon and Lisbon Cathedral. Then, indulge in a delicious dinner of typical Portuguese cuisine, while listening to traditional Fado music performed by live musicians. Explore Lisbon in a unique way with this tour by electric tuk tuk, an eco-friendly way to travel around the city’s narrow streets. You’ll be driven by a guide through historical neighborhoods like Alfama and Mouraria, and stop at a viewpoint for photo ops of the city. Pass by attractions such as Praça do Comércio, and finish up in Belém. See Lisbon from a different perspective during a 2-hour Tagus River cruise at sunset, undoubtedly the most magical time to see the city. From the boat, you’ll enjoy unobstructed views of Belém Tower (Torre de Belém), Lisbon Cathedral (Sé de Lisboa), Castelo de Sao Jorge (St. George’s Castle), and many more Lisbon attractions. Plus, several departure times throughout the day allows for flexibility. Create your own itinerary and see the Lisbon attractions of your choice on this private half-day tour. Select points of interest with your driver such as the Lisbon Cathedral, Park Edward VII, the neighborhoods of Alfama and Bairro Alto, the Jeronimos Monastery, and more. Learn about the city’s rich history from your guide and even sample a custard tart at the famous Pastel de Belem. See the heart of old Lisbon during a three-hour walking tour led by a knowledgeable guide. Explore the Alfama and Graça neighborhoods, learning about the history of the city as you pass important sites like São Jorge Castle and the National Pantheon, which is located in the 17th-century Church of Santa Engrácia. You’ll also check out Santa Luzia Church and take in sweeping views of the Tagus River from the Miradouro das Portas do Sol. Choose either the morning or afternoon tour that suits your schedule. Immerse yourself in Lisbon history and culture on this sightseeing tour through some of the city’s most interesting and popular neighborhoods. With an informative guide, check out Chiado and Bairro Alto, enjoy views from Miradouro São Pedro de Alcântara, and visit the Alfama district. You’ll also enjoy a ride on the Eleléctrico tram for a must-do Lisbon experience. Jaunt around town on this 4-hour Lisbon electric car tour of Old Town and Belém with GPS audio guide. Settle into your electric 2-seater Twizy car and start your adventure. Cruise through the historic Alfama district, driving through narrow cobblestone streets, then discover why people love Graça and Belém. Learn about Portugal’s historic explorers and more fun facts with the help of your recorded audio guide. Cheerful, calm, and vibrant, Lisbon is a capital like no other. The city has a lot going on with events, exhibitions, flea markets.But it also offers a peaceful and relaxing environment where visitors can stroll off the beaten path and revel in nature or wind up in a historic neighborhood where time seems to stand still. Uncover the charm of Lisbon’s oldest quarter on this 3-hour small-group walking tour of Alfama. A friendly local guide will lead you through some of the area’s most beloved sites including the Miradouro da Graça and the Miradouro Nosso Senhora do Monte. If the famous “Thieves Market” is open, stop in and enjoy the chance to shop at the oldest flea market in the city. Go beyond the guidebook and see the charm of Lisbon on foot during this historic, fully-guided walking tour. Note that you have a choice for either morning or afternoon options. Hoist the sails on your next adventure when you book this Lisbon sailing tour. This activity lets you actively participate in sailing the boat—a fun learning experience for passengers of all ages. Plus, snack on Portuguese cheese, smoked sausage, and wine while you admire views of the beautiful coast. Narrated commentary ensures you don't miss a single sight. Discover the best of Lisbon with a fun tuk-tuk ride through the city. Zoom through the historic neighborhoods of Alfama, Graça, and Mouraria and see landmarks such as the Lisbon Cathedral, the National Pantheon, and the Saint Vincent Monastery. If you book the tour for Tuesdays or Saturdays, there’s the option pass by a local flea market. Cover more ground in less time on this 3-hour tuk-tuk tour of Lisbon, ideal for those with limited time in Portugal’s capital city. Renowned for its hills, Lisbon is a tiring city to explore on foot, so save your legs and travel with ease in a motorized tuk-tuk. See top attractions such as the 12th-century Lisbon Cathedral, the National Pantheon, and the UNESCO-listed Jerónimos Monastery and Belem Tower. Hotel pickup and drop-off at selected Lisbon hotels are included. Zip through Lisbon's hilly streets on a private Segway tour of the city that lets you explore from street level without breaking a sweat. You'll get a great orientation to the city by gliding from place to place with a local guide, passing top landmarks and colorful neighborhoods, from the traditional atmosphere of Baixa to trendy Avenida de Liberdade. Take advantage of your time with a local to chat about Lisbon culture, picking up tips on where to eat, drink, and explore in the city. Travel in comfort on an 8-hour private tour of Lisbon’s top attractions. Visit the Baixa District and the Lisbon Cathedral, then stop at Castelo de Sao Jorge (St George's Castle) where you get sweeping views over the city. Explore districts including the Chiado, the historical Alfama and Graça quarters, and Belém, where you see Belém Tower, Discoveries Monument and the Monastery of St Jerome (Mosteiro dos Jeronimos) — a UNESCO World Heritage site. Discover the modern Expo ’98 district located along the Tagus River and much more on this comprehensive tour. This is a fantastic way to see the view of Lisbon from the river, is the confort and smooth navigation of a catamaran. With a fantastic buffet lunch served during the tour.A tour for all family. See Lisbon up close and personal during this 4-hour small-group walking tour. This tour will take you on some of Lisbon’s most celebrated tenants of local life, including the No. 28 tram to old town and the city’s oldest flea market, the Feira da Ladra. Visit the famous medieval cathedral and tour the Saint Vincent Monastery and National Pantheon. In Alfama, one of the city’s most well-known neighborhoods, visit small squares and navigate steep streets where you’re likely to hear Fado, a kind of traditional Portuguese music. Don’t miss this opportunity to see a unique side of one of Europe’s greatest cities. Discover the magic of Lisbon during this private 4.5-hour tour with a local guide. After being picked up at your hotel you’ll travel to the central areas of the Baixa District, Restauradores and Rossio squares as well as the gorgeous Cathedral of Lisbon. Wander inside the city’s ancient castle and explore the historic Moorish quarter. You’ll also have the chance to visit the famous Monument to the Discoveries, the Tower of Belém, Eduardo VII Park and the Terreiro do Paço Square. This private tour is customizable to suit your own preferences, and you can chose from a morning or afternoon experience. Perfect for those with limited time in Lisbon, this private 1-hour tuk-tuk tour provides concise and comprehensive insight into the city’s most popular neighborhoods. Glide through picturesque districts such as Alfama, Graça and Mouraria, and listen to history-rich commentary from your guide. Tick off sights such as Lisbon Cathedral, Rossio Square and the National Pantheon, and enjoy the convenience of pickup and drop-off at selected Lisbon hotels. Explore the highlights of Lisbon with ease on a private full-day tour that covers the best of Portugal’s capital city. 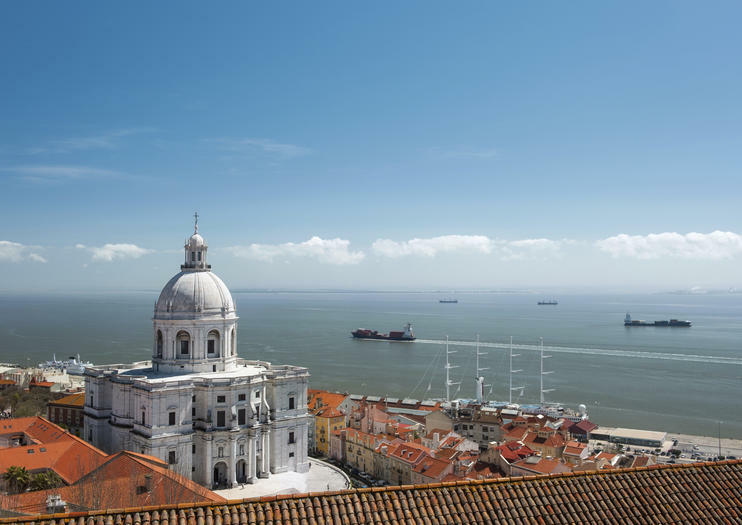 Visit top sights in the Belém district, see Commerce Square and the Tagus River, find tasty food in Alfama, and check out viewpoints overlooking the city. You’ll take in old churches, grand plazas, and UNESCO World Heritage sites such as Belém Tower and Jerónimos Monastery. Zip through Lisbon's historic neighborhoods by open-sided tuk tuk on a private tour that can be tailored to you. Traveling in a noise-free, electric tuk tuk means you'll have clear views throughout the trip, so you can snap photos or just enjoy views of the Douro River, towering cathedrals, colorful markets, and more. Take advantage of your time with a private guide by stopping as often as you'd like to take pictures or explore, beginning and ending the trip in the heart of Lisbon. Fall in love in Lisbon! There might not be a better place to see a sunset in Lisbon than from the water. This sunset sailing trip takes you past many of the city’s main points of interest—including Padrão dos Descobrimentos, Mosteiro dos Jerónimos, and the Museu de Arte Popular—with a skipper and steward who looks after you and your group. Plus, get a tasting of sparkling wine and fruit.